Looking for cheap canvas prints that are easy to make and made with high quality materials? Our wrapped photo canvas prints are an elegant way to showcase any treasured photo. Give any room a contemporary, gallery-like look while adding a pop of color to your decor. Our wrapped canvas prints are available in a range of sizes so you can fill any drab wall in your home with personality! With our gallery wrapped canvas, your photo will be printed on the highest quality artist canvas stretched around a durable frame for year after year of enjoyment. Gallery wrapped canvas art is ideal for any home décor style and is perfect for warming up your home with your treasured memories. The difference between gallery wrapped canvas and stretched canvas is a matter of finely finished details. Your custom gallery wrapped canvas arrives ready to hang and will show off any photo to its fullest potential without any further adjustments needed with a studio or stretched canvas. Choose from several sizes ranging from 5×7 to 32×48. Select from square canvas sizes, panoramic and easel back options. Available in 1 ¼” and ½” thicknesses depending on canvas size. Choose photo wrapped edges or custom color edge options. Includes a professionally sealed back and arrives ready to hang. Designing your own photo wrapped canvas is as simple as gathering your photos and choosing a wrapped canvas size that suits your image. With just a few simple steps, you can create your own photo canvas and display it in your home to liven up your décor. Start off by choosing your gallery canvas size and then select either a landscape or portrait orientation. Afterwards, choose from either a photo wrapped edge or color edge to fit your style preferences. Then, upload your photos from your computer, phone or mobile device. Once your canvas opens in the project builder, simply drag and drop your photo onto your canvas from your photo folder. You can then position your photo to center it to your liking. If you’ve chosen the color wrapped edge, you can use the background tool to select your canvas edge color. After reviewing your canvas layout, simply add it to your cart and place your order. Once your canvas arrives at your door, it is ready to hang. Depending on your canvas size, you can showcase it on your wall or on a table or shelf to brighten any room with a cherished memory. Take any digital photo print a step up and transform it into spectacular wall art. Gallery wrapped canvas prints can be displayed in any room in your home to add color and character to your decor. 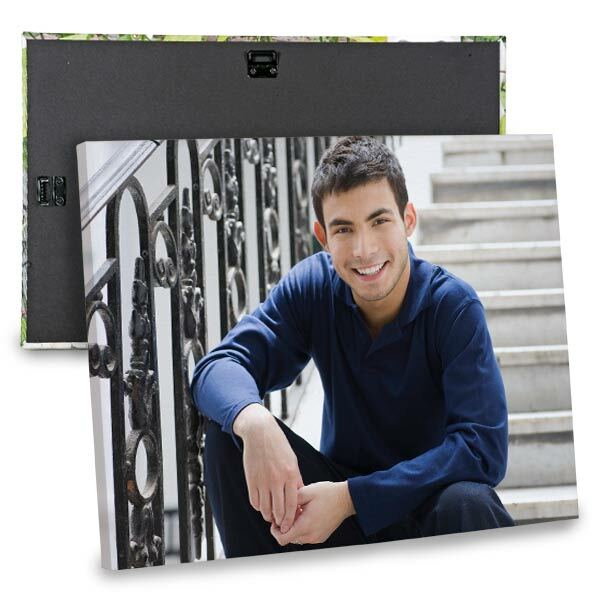 Printed on the best quality artist canvas, your favorite photos are sure to look their best! Maybe you have a treasured snapshot of the family from your last summer beach vacation. Create a gallery wrapped canvas by uploading your beach photo to Winkflash and choosing the perfect canvas size to display it on any wall around the house. Go big and showcase it on your living room mantle with our classic 24×26 gallery canvas print. Or, fill up a corner in your bedroom with a few 5×7 canvases printed with your best natural landscape pictures. The results will not disappoint. Whether it’s a family vacation photo, a wedding memory or simply a wonderful snapshot of the kids, you can be sure it’ll look great printed on canvas. Even better, our gallery wrapped canvas will give your photo a touch of elegance that is perfect for a home of any décor! We have a variety of wrapped canvas options that can be customized to fit your favorite photos and your décor. The difference between standard and gallery wrapped canvas makes the process of printing photos on canvas easy. While standard canvas prints come rolled up, our gallery wrapped canvas prints are already stretched and include built-in hardware so they’re ready to hang as soon as they’re delivered! Even better, you can choose from a variety of different sizes, orientations and canvas edge options to make your memories stand out and brighten your décor with your own personal twist. Gallery wrapped canvas prints are a great way to really make a statement with a cherished photo. We offer a variety of sizes ranging from 5×7 to 32×48 that are sure to do your photos justice. Depending on the photo, you can select either a portrait or landscape layout for the perfect fit and hang it on your wall to update your décor with color and character. Gallery wrapped canvases are sure to add a touch of elegance no matter where they’re displayed! In addition to our standard wrapped photo canvas collection, we have eight square canvas sizes perfect for brightening up your walls. Square canvas prints are ideal for adding symmetry to your decor and can be displayed in box-like configurations for a pop of style. Display your treasured digital images or showcase your favorite Instagram photos for a unique exciting wall art accessory! Maybe you took an amazing panoramic shot with your smart phone during your last hiking trip or vacation to the beach. Our panoramic gallery wrapped canvas is the ideal choice for displaying your panoramic photos! They also make a great addition to any focal wall. Hang one over your fireplace mantle or above your living room couch to fill up your wall with panoramic panache. Like our other gallery wrapped photo canvas options you can go vertical or horizontal to fit your wall and your photo. 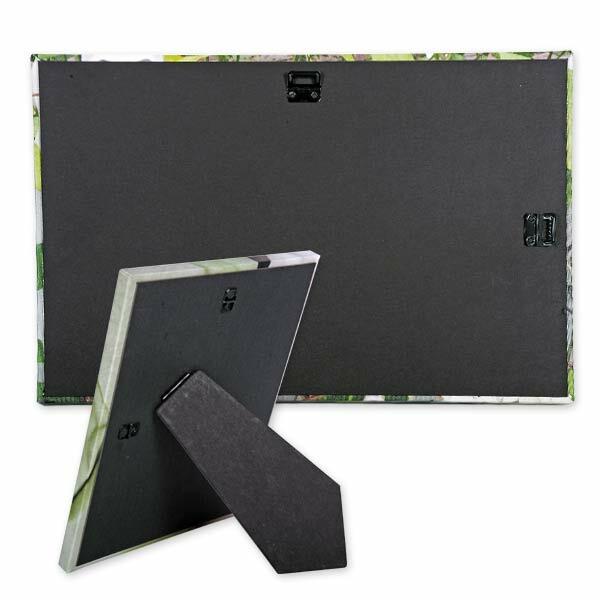 Our easel back gallery wrapped canvas is ideal for decorating any flat surface around the house! Not only do they include an easel for standing, but they also have hanging hardware so they can be displayed on your walls as well! Choose from 5×7 and 8×10 sizes and decorate any shelf, fireplace mantle, table or counter with photos. They are completely versatile and will fit in virtually anywhere, no matter where you choose to display them! Our Canvas Photo Décor collection includes a variety of stunning photos showcased on a gallery wrapped canvas. Select from multiple sizes to fit any wall in your home and decorate your home with bright, colorful photos that are guaranteed to impress. We have a wide range of photos to choose from including exciting abstracts, dramatic nature compositions and lively urban landscapes that will surely fit your home’s unique flair. Some of our gallery wrapped canvas décor prints are of iconic landmarks and some depict unusual and amazing nature scenes that will become a focal point in any room. The possibilities are endless! Fill up your walls with a beautiful arrangement of photo canvases! Winkflash offers a collection of six stylish cluster arrangements printed on gallery wrapped canvas. Choose a wrapped canvas arrangement depending on the number of photos you want to display as well as the size of the wall you want to decorate. We have a canvas arrangement that’s just right for you! Our Center Focus Five Collection is ideal for displaying a grouping of your favorite portrait photos and would look amazing in any entrance hall. Maybe you want to decorate the wall above your living room sofa with a little character and color. Our Trinity canvas arrangement is ideal for that classic, symmetrical look that is sure to turn heads. No matter your style, we have a canvas wall arrangement that’s tailored to your taste! Give your décor a little personality with our quotes on canvas. Each quote is printed on the best quality gallery wrapped canvas to give your décor an elegant look. Choose from dozens of quotes that inspire joy, love, motivation and more, each with its own unique style. Like our canvas décor photos, you can choose from multiple sizes to fit your wall perfectly and make a bold statement wherever they’re displayed. While our inspirational quote canvas collection offers many options, you can also create your own with a personalized message or saying. Select a background color, and then use our text feature to have your own personal quote custom printed on your canvas. We offer a wide range of font styles, text colors, and you can adjust the size to complete your canvas layout. Whether it’s a special family saying or a quote that inspires positivity each day, you can create a quote canvas that’s uniquely “you”! If you like the beauty of a gallery wrapped canvas but can’t choose a favorite photo that you want to print, our canvas collage prints are definitely the way to go. Select from a variety of gallery wrapped canvas sizes, choose a photo layout and display a series of your cherished photos for everyone’s enjoyment. Collage on canvas prints are a great way to tell a narrative of one of your favorite memories. Perhaps you took several snapshots of the kids during your last hiking trip. They’d be perfect for your collage and will look great printed on a gallery wrapped canvas! Maybe you’re looking for a special way to celebrate and showcase a favorite photo. Perhaps you want to add a little life and personality to your décor, or you want to create the ultimate gift for a loved one. No matter the occasion, our gallery wrapped canvas prints can be customized in a variety of ways and are ideal for adding a lively flourish around your home. Relive your most prized moments while making a unique décor statement that your friends, family and houseguests will adore. With so many options to choose from and with just a few easy steps, you can create the perfect custom canvas to show off any photo in style!